For many, finding a passion can be a challenging. The trick is to narrow it down. Kimberly Hall, director of donor development of Goodwill of Central and Northern Arizona presents at August’s Professional Women’s Alliance. We hear ‘pursue your passion’ all the time. While it is sound advice, identifying passion and pursing it are entirely different. 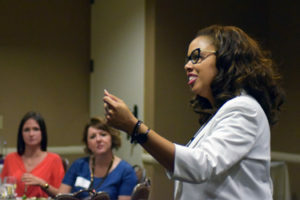 During August’s Professional Women’s Alliance luncheon on August 8, Hall gave the audience tips to determine their passions and reasons why it’s important to ultimately fulfill those passions. Online assessments can also help determine talents, gifts and personality traits that ultimately can become a personal passion. Halls adds the best way to have success in developing and pursuing a passion is to build in accountability with yourself and others. Hall encourages everyone to discover their passion because she believes it can be used to help others and better the community. Hall ended her presentation by revealing how she discovered her own passion for service while volunteering at a local shelter. The next Professional Women’s Alliance features Bahar Schippel, Partner, Snell & Wilmer on Tuesday, Sept. 12. She will discuss lessons learned from hardships during her formative years and how that adversity enabled her to develop the toughness, dedication and compassion to succeed in her career. Register Today!